The Stormpheonix rules the world with an iron fist. High above the commandeered Shield hellicarier all the mutants of the world have been reduced to children kept “safe’ by their goddess. Outside the ship those who have opposed her over the years are suspended in a state of cryogenics. On the ship one man contemplates betraying her. In the ocean the yallut people are out hunting whales, this like all other non-environmentally friendly things have been outlawed. SP is told by Kitty Pryde of what is happening she decides to deal with this breaking of her treaty for the third time decisively. That she does not just to those who fish but she also wipes out their entire town, to ensure no one would dare cross her again. 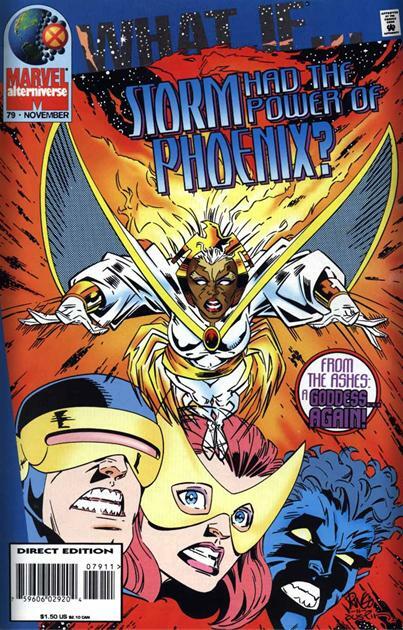 We are then treated to her origin, how she tried to fly the ship and all the x-men died except for her and wolverine. She returned to Africa as the phoenix and went about setting the world right. Wolverine and the old man that’s known storm since she was a girl meet with the resistance. Comprised of the Black Panther, Dr. Doom, Nick fury and their allies, they locate the real storm still sleeping in the downed ship. Unable to rouse her they choose instead to have Shadowcat commandeer the body for a puppet act. They attack her fortress and free her captives. 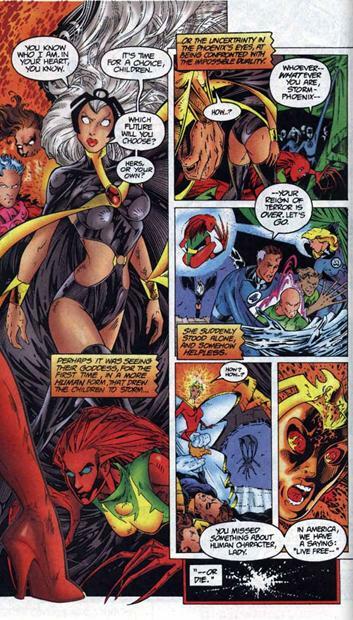 Faced with an enraged Storm Phoenix Shadowcat in the original Storm’s body sways all of SP followers to go with her. Confused and abandoned our hero’s make their escape as the ship is blown up with SP inside. 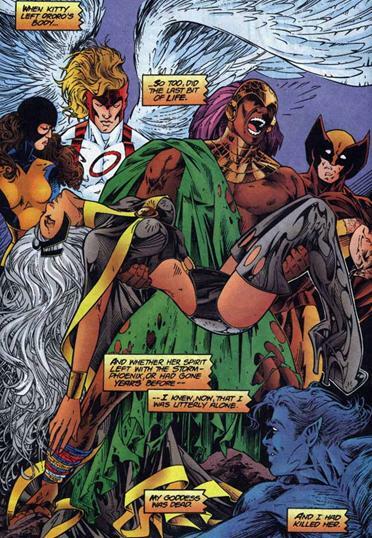 When Shadowcat leaves Storm’s body she dies and infighting begins immediately between the now free and the rebellion. Those who betrayed SP wander if they will be able to lead any better than she could. This was one of the better what if stories I’ve ever read. 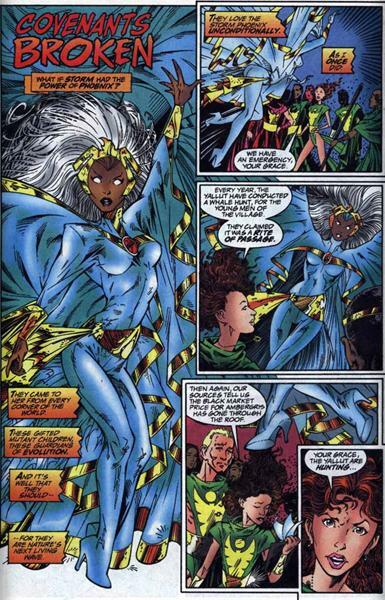 The back story of how Storm arrives at being the phoenix was believable enough for the reader to suspend their disbelief and be drawn into the tale. Storm rendering everyone back to pubescents was also a nice touch since she has often been the “Mother” of the x-men group. This allowed her to control and protect the mutant populace from themselves, and each other far easier since none were at their most volatile or most powerful. Kitty’s closeness to the more powerful storm was also believable since they have always been portrayed as mother and daughter. Her betrayal at the end was also quite compelling since it was accurately portrayed that SP had the utmost faith in her above all others. The pro-earth stance that SP took also stayed true to the love of Mother Nature which storm often portrayed. As an ode to real continuity was the discovery of the real storm in Jamaica bay much like the real jean was found. The real storm dying at the end however pointed to something none of the ‘heroes’ realized…..SP is not dead….and will rise again. It was also true to human nature that as soon as SP had apparently been defeated infighting would set in about who should lead them and their new purpose in life. We are left wondering if they have not traded the devil they knew for the devil they did not. Colors were all over the place! Shadowcat a central figure to the tale often had red hair except when she was in her original costume. The art was also inconsistent; on some pages they were ok on others just hideous. The colorer had the wrong colors in many places.